Australian Spitfire Mk. VC serial no. BR543 ZP-T of No. 457 Squadron displaying an interesting personal Pegasus emblem. 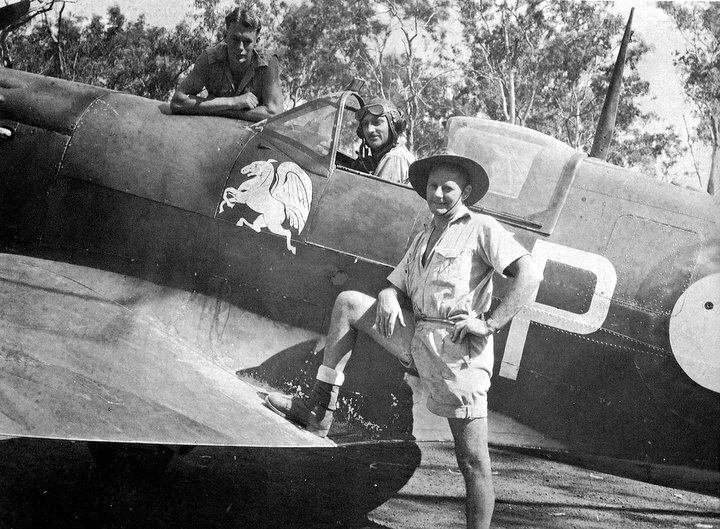 The pilot posing in the cockpit is Jack Newton, and the two other men are his fitters. This aircraft was amongst the first Spitfires received by No. 457 Squadron, receiving Australian identification number A58-49. It served with this unit for a year from November 1942 to November 1943, participating in several combats against the enemy. Jack Newton experienced a close call in this machine on 28 June 1943, when his Spitfire was badly shot up in combat, resulting in the damage to both wings, engine and airframe. Newton escaped unscathed. BR543 subsequently served with No. 452 Squadron RAAF before being moved to second-line duties in March 1944. In October 1945, it was put in storage, only to be finally struck off charge and scrapped by the end of 1948. The two fitters are Andy Anderson and my father Bill Conant (with foot on wing). Bill painted the 'Pegasus" and all the other motiffs for the squadron. When pilot Jack Newtown was posted 'south', the emblem was removed for 'personal' reasons. See the Unsung Hero's Site on the Temora Aviation website. Jack – AKA Snapper – Newton was my father, and I have a print of this photograph in an album. Thanks very much Vince for the information above. I didn’t know the Pegasus was removed – as I recall the Pegasus was a reference to the fact that my father, who was a terrific horseman, switch from the Royal Lighthorse to the RAAF when he realised there wouldn’t be a lot of cavalry in WW2. And further to the caption, he didn’t escape quite unscathed – he burst an ear drum which affected his hearing, not severely, but somewhat.